In my life I have been blessed as an athlete and father of two precious children, Cara 16 & Seth 8. My career as an athlete started at a young age, as a teenager I played football and boxed at the Golden Gloves in Akron Ohio. In 1982, I moved to Florida and got involved in bodybuilding and power lifting which became my true love. As a teenager I was able to accomplish winning just about every bodybuilding and powerlifting meet in the state of Florida. My career took off like a rocket in 1986 when I took a world record in the bench press at 5’8 and 220 pounds; I had pressed 575 and 610 pounds ranking me number one in the world. At that time I had channeled my strength to pursue a career in bodybuilding. Winning the Mr. Florida, Mr. America, and Mr. USA titles gave me professional recognition as one of the greatest pro bodybuilders and powerlifters in the world. Having competed as a professional bodybuilder for fifteen years I decided to retire in 2002 giving up my pro status as an IFBB pro athlete and moving on to what God has in store for me next. I have been blessed in my career accomplishing over seventy-five national and international magazine covers, 360 articles & advertisements along with numerous endorsements. The highlights of my career have been working with Arnold Schwarzenegger, being featured doing a series of photos for his bodybuilding encyclopedia along with competing in the Arnold Classic. I was also honored to have the privilege to work with Vince & Linda McMahon endorsing ICO/PRO, and competing in the WBF, one of the highlights of my life. And last but not least Mr. Joe Weider.aka (The Master Blaster), I owe a lot to this man for taking me under his belt for the last twelve years, and for having faith in me as a pro athlete & contracting me for most of my professional career. I am honored, and always will be for being an endorser of Muscle & Fitness, Flex, and Weider Nutrition. My career has enabled me to travel the world, and meet some of the world’s greatest people. I thank God for blessing me with the opportunity to meet these great people who have become my friends, and by giving me the strength to be the best athlete and father that I can be. I would like to take this opportunity to thank my fans for all their support through the fifteen years of my professional career. Your letters have always given me the drive and inspiration to be the best athlete that I can in the sport of bodybuilding. 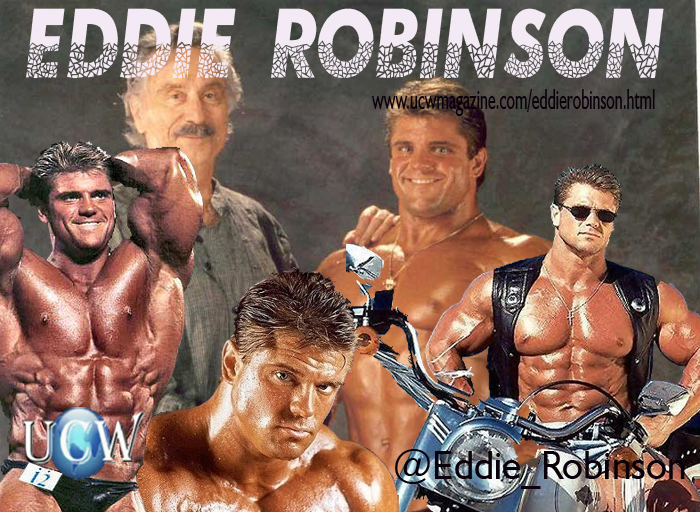 Please remember, just because I have retired from the sport of bodybuilding don’t think that this is the end of Eddie Robinson, I promise you this is just the beginning! I am up to bigger and better things, a new chapter in my life. I have captured all of these achievements for a reason. Now it is time to capitalize on all of these achievements and put them to work.